The Apps Page gives you a high-level overview of all applications found and monitored across all servers in each environment. You will be able to view your apps by its category: Web Apps and Other Apps. From both the Web Apps and Other Apps pages, click on any app to take you to the App Dashboard to view more information for a particular app. The Web Apps page will show you web performance data such as Requests/Minute and Satisfaction % scores that are only available to Web apps. Other apps include non-web app types running on your monitored server including system & custom services as well as scheduled tasks. 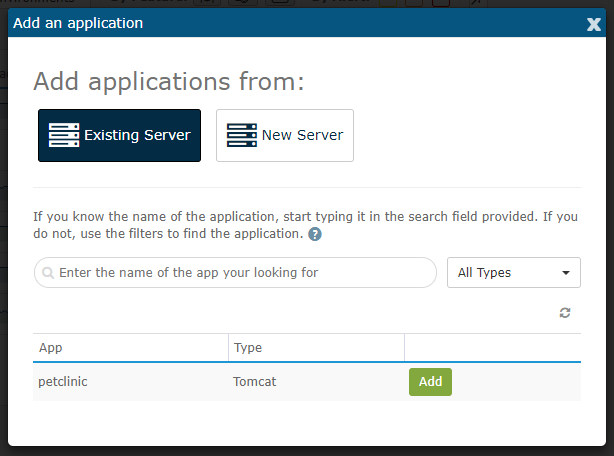 Just like on the Web Apps page, the Other Apps will show an overview of apps that can be filtered by name/environment, app type, feature type, and other fields. If you don't see an app that you expect to see, click on the "Add App" button to bring up a modal to either add apps from a monitored existing server or start the process of installing the agent on an unmonitored server. To remove an app so that it doesn't show up in the list of apps on the Apps page, you can remove the application/service by clicking on the cog wheel icon to the right and selecting "Remove App". After confirming your selection, the app will be removed until you add it back using the Add App button.